Locally-owned independent retailers contribute a vast amount to cities. Equally, it's almost impossible to see how national or multinational chains genuinely contribute much to cities at all. That's not to say that national retailers don't have a place - the Mujis of this world clearly contribute a great deal, economically but also symbolically, as cultural goods. But they don't contribute to cities in the same way. But it's not a simple economic value. They are also nodes in the tight networks of weak ties that form local communities. Further, the grain, vitality and appearance of the street is nourished and enlivened by the local independent retailer - whether a grocer, a kids' shop, a paper shop or my own area of fervent interest, the book store or record store. When I arrived in Sydney from London, I managed to sniff out Published Art bookshop and TITLE Film + Music within the first week. I knew everything would be fine after that. 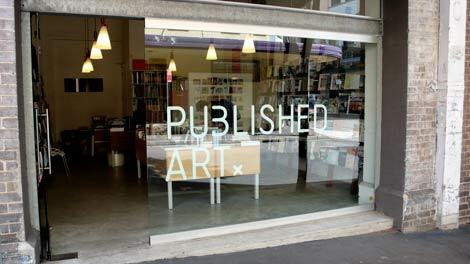 Published Art is truly a world class design, architecture and art/photography bookshop, tucked into the city end of Surry Hills. Curating with some discernment, only single copies of books are stocked and thus don't remain on shelves for long. This means that titles can be displayed cover outwards, as intended, and the store always has (too many) books and magazines of interest every single visit. 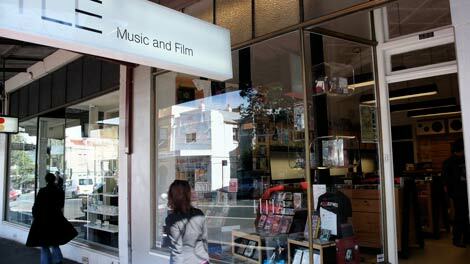 TITLE is also a world class music and film store, located amidst the urban greenery of Crown Street, also in Surry Hills. The cinema is catered for through a near-perfect selection of DVDs, heavy on the Criterion Collection specials, quality boxsets, art-house movies from around the world, and with a peppering of curios and cult classics. The music selection is equally wide-ranging, with what must be the densest concentration of ECM in the southern hemisphere alongside the best of the world's avant garde labels and non-mainstream music from reggae to classical, all threaded through more accessible product to hook the half-interested. A global view, combined with a strong representation of local antipodean product, sidesteps any lazy notion of 'world music'. It's just a great selection, curated by staff who know their onions and who also provide excellent service. Not everything works and not everything is to my personal taste, but that's the point. In curating, you take a stance, make an editorial decision. Again, it's clearly more than 'just a business'. Not long after discovering it, I wrote a short piece on TITLE for Monocle's regular record store column, but I thought readers here might be interested in a longer, near un-edited cut of the interview I did with owner Steve Kulak. To me, Kulak's work indicates the value of the local independent retailer to the community, particularly when selling cultural products. It also shows the value of cultural businesses - local and global at the same time, hooked into local networks of producers and consumers as intermediaries, vibrant and challenging, emanating from the specific cultural milieu of the city, and making money and making streets at the same time. Another bit of admin. After a couple of weeks of rapid-fire consultancy directly post-Monocle, I joined Arup as a senior consultant in their urban planning business across the Australasian region. A month in, and I'm enjoying it hugely. I'm particularly proud to be working for Arup, a company I've long admired for both their work and their approach to work. For those that don't know, Arup are one of the world's largest multidisciplinary design firms: 10,000 strong across nearly 90 offices worldwide, comprising designers, engineers, planners, business consultants etc. Multidisciplinary working is at the heart of the firm, and the strong philosophical foundations are derived originally from the founder, Danish engineer and philosopher Ove Arup. Their roll-call of buildings and built infrastructure is almost the stuff of legend. It's really impossible to list the projects - but a few personal highlights would be: Highpoint 1, Spa Green Estate, Tate Modern and Millennium Bridge in London, Centre Pompidou in Paris, Seattle Public Library, Casa da Musica in Porto, CCTV and National Aquatic Centre in Beijing, the Channel Tunnel Rail Link, the Oresund Bridge, the Dongtan project outside Shanghai ... and many projects here in Sydney, from the small but perfectly formed Andrew Boy Charlton Pool to perhaps the greatest building of the 20th century, the Sydney Opera House. I sit within the urban planning business here, and in a nutshell I'm responsible for figuring out how information and communications technologies (ICT) will shape future cities. That means a lot of things to a lot of people, but would include urban informatics and pervasive or ubiquitous computing, how to shape or 'landscape' informational services and products within the context of both masterplanning and urban design, the various relationships between data and built fabric, information visualisation and urban design, building new platforms and interfaces for urban design, changing design processes and the knock-on onto organisations (including our own), exploring how we can engender sustainable behaviour via feedback on behaviour, advising on urban policy for innovation and ICT, urban renewal via creative industries etc. etc. I'm currently exploring a few ideas in particular, such as extrapolating and aggregating Building Information Modelling (BIM) techniques up to the city level - to form a kind of 'City Information Modelling' (CIM). Taken with the feedback from urban informatics, this could then extend the design process out over the true life-cycle of the project, including inhabited and adapted, which would mean a four-dimensional modelling process taking into account the living city, or a '4D Urbanism'. You'll note these concepts are still a bit slippery, to say the least. I'm hugely excited by the promise of all this. About 13 years after I started exploring the impact of ICT on cities and vice versa - with the Northern Quarter Network in Manchester, UK - I've come full circle. As ever, I'll try to share what I can here, in this semi-public sketchbook or journal, and now the dust is settling a bit I'll attempt to publish a little more regularly again. OK! Enough admin. Spot of admin, forgive me. I'm doing a presentation at Creative Social tomorrow night (Thursday 14th May 2008), here in Sydney. This particular edition of Creative Social is organised by my friend Tim Buesing, and forms part of a wider global network of workshop-style sessions and presentations aimed at creative directors. I'll be doing something around these themes of urban informatics, or how information and communications technologies are re-shaping all things urban: form, everyday life, planning, wayfinding, architecture, public space and so on. Keynote is glaring at me from the dock, below, so I'd better get to it shortly. I gave a precursor of the talk at a public lecture organised by University of Technology Sydney, a couple of months ago. I was invited by Adrian Lahoud, and it formed part of an excellent series of public lectures around architecture and urbanism. If you're at a loose end in Sydney tomorrow evening and would prefer an alternative to my talk, you could do worse than go and see the next installment in the lecture series, delivered by none other than the Lord Mayor of City of Sydney, Clover Moore MP. She'll no doubt be majoring on their recently launched Sustainable Sydney 2030 strategy, much inspired by Jan Gehl's recent report for the City of Sydney. I'll post my own thoughts on all that soon enough. Next week, Duncan Wilson and I are attending the Pervasive 08 conference here in Sydney. Our position paper was accepted by the workshop on Pervasive Persuasive Technology and Environmental Sustainability and so Duncan and I will be taking part in that, alongside a bunch of international researchers and practitioners in this area, such as the likes of Eric Paulos, Paul Dourish, Tom Igoe et al. I'm looking forward to the whole conference hugely and hope to post our paper shortly, including reflections on the workshop. Finally, in July, I'm speaking at Design Capital, part of the State of Design festival in Melbourne, as part of the 'Convergent World' session on day 3. It'll be great to hook up with friends like Allan Chochinov of Core77 and Michael Trudgeon of Crowd, and to meet a few new people too. Also happy to say I'm a judge in the 2008 Premier's Design Awards there too. Do get in touch if you're in town at the same time, or want more info on any of the events. More news to follow, and then a return to your usual programming. 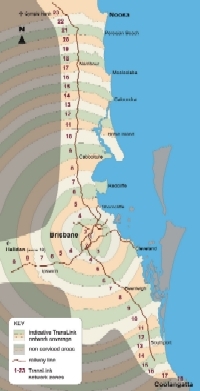 (Something of a follow-up post to the recent transport informatics survey.) A recent conversation with Jarrett Walker, a consultant based here in Sydney, popped up the following thought. Jarrett, experienced in metropolitan transit systems, was thinking through ideas around fare pricing given the new possibilities enabled by fully automated systems. Design of fare structures have been fundamental to transit planning for years, attempting to define charges for journeys in equitable yet efficient fashion. Balancing those last two factors mean that the basic problem is often shot through with tensions - e,g, richer suburbs paying less than poorer, due to zoning often based on radial principles emanating from a central core, and so on. Jarrett knows more about that than I. Whatever, existing systems based around zones etc. do at least usually have a stated, consistent pricing for journeys that can be easily communicated, even if not necessarily agreed with. However, Jarrett was wondering about some emerging thinking he'd heard around the possibilities of new smart card-based, integrated ticketing systems, and the sense that varying prices could be generated in real-time, based on variables like distance, time of day, number of passengers on board, overall running costs of the system at that point, demand etc. That you wouldn't know the actual price you'd been charged for that particular journey and that actually, you needn't. You just swipe the card and conduct your journey, in the knowledge you'll have pre-paid to a certain amount, or pay a monthly bill subsequently. You'll trust the system will charge you fairly, of course, and you could see the breakdown of costs at the end of the month, or when your pre-pay card needs topping up, and so on. So the drift towards an ongoing service model of variable pricing bundled into pre-paid or direct-debited packages seems an option. 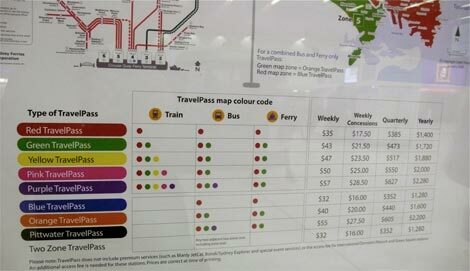 With an increasing deployment of GPS devices in all vehicles and RFID-based tracking of passenger entry/egress, it seems likely that some transit systems will try this out, in effect neatly hiding the complexity of pricing from the citizen. This is partly also due to the sheer complexity of pricing systems e.g. Sydney's train system alone has over 120 'fare products', apparently. Multiply that by ferry, bus and light rail. This fare complexity is largely a result of attempting to be equitable, and at the moment the complexity is shared by both system operator and customers. When he asked me the question about whether perceiving the sysetm was important, I immediately thought of the importance of seams and imageability. Seamfulness, some long time readers will know, is a particular interest here (and of others, like Anne Galloway and Adam Greenfield.) It holds that a desire to hide complexity via an apparently perfect, hermetically-sealed product can actually mitigate against a successful informational system. A classic example here is the iPod, which given its undoubted success also indicates how complex the argument is. That success is down to its carefully linked system architecture with iTunes as well as its rigorously reduced interface and seductive aesthetic. And yet its alleged undoing is also to do with its 'perfect' design, in that batteries are difficult to replace (meaning most people don't) and that it's a music experience that can't be tweaked or modified much. You could argue that if the iPod showed its seams a little more, it would be more malleable as a device, and even more engaging as a product experience. Doing that without damaging its seductive sheen and usability would be tricky but potentially rewarding. That old "beautiful seams" ambition. So it seems to me that the ability to show/hide structural detail is fundamentally important element of a system. It enables the legibility of the system. And that showing a bit more detail, if carefully and sensitively articulated, can only engage the user further. Not necessarily exposing minute technical detail - though a handful will always want that - but enabling perception of the basic ambit, structure, joints, seams, influences, and so on. It certainly enables that form of engagement known as adaptation or even hacking - not in the pejorative sense of the word - but in the sense of building upon systems and extending them - as we've seen with transit systems that do begin to expose their behaviour. And of course, as these and similar pervasive systems migrate into many spheres of life, deciding how visible to make parameters, motives and controls becomes even more important. Will hiding such intricacies reduce civic engagement in urban information systems? Or conversely, will its seamless design lead to increased take-up of services like public transport and thereby greater civic engagement? What do you think? I'm aware that I'm posing the question to a particular audience, but do you think that, in this case, a transport system that has a choice to hide the potential complexity of a fare system should do that? 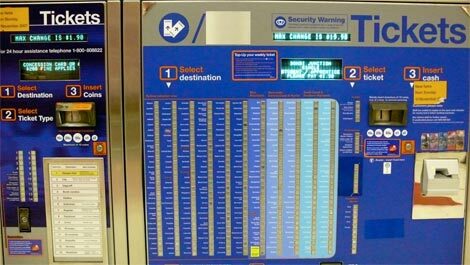 Or should it reveal its complexity either through having set fares or by displaying the calculated fare on the spot? Does convenience trump legibility?